Say goodbye to buy now, pay later – get saving! The days of ‘buy now, pay later’ are pretty much over. We can’t be so sure about how safe our incomes are, so saving for holidays, Christmas and emergency purchases is the best way forward. 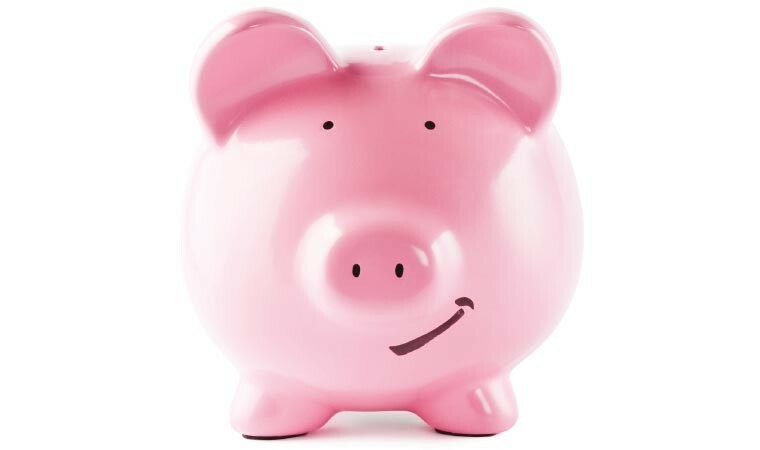 It’s been years since savings accounts offered really generous interest – the money banks pay you to save with them. If we want the money available for emergencies, the best pay only around 1.5%. (This means £1.50 for every £100 left in them for a year.) Accounts offer more interest, if we’re willing to give notice before we get the money. As if shopping for a TV or something, look around and see who’s offering what. Comparison websites can save us some leg work but remember to look at a couple as they have different deals. 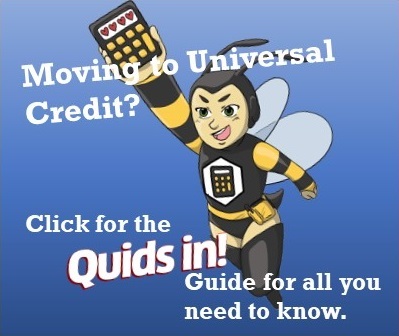 See Quids in!’s guide to using comparison websites here. Martin Lewis at MoneySavingExpert has more detailed advice too (click here). But here’s our toppest tip: Want to earn 50p for every pound in savings? Hit up the government’s Help to Save scheme. More details here. The best way to treat savings is to set them up, let them run like clockwork and then forget about them. Some of us don’t like carrying cash because it ‘burns a hole in our pocket’, as they say. We spend it because we know it’s there. Same with savings. Decide how much to save (based on what we can afford or what we’re trying to save) and have a direct debit do the rest. We should always know what is in our current accounts (to stop us overspending) but check the savings balance rarely. It won’t just be a nice surprise, it’ll stop the temptation to withdraw it early. Don’t be fooled by Christmas savings schemes. Glossy plans offered by Park, Variety or Intu, for example, look attractive and appear to offer a good deal. Always check they really offer any real value. We could just as easily open our own account and pay into it every week or month? Worse, as thousands discovered when Farepak went bust, if they collapse they take our money with them. Unless the nest egg is worth £85k or more, cash is much safer in a savings account. It could be earning interest too, so there’s a bit more than we put in. When thinking of joining a club, check whether they allow or charge customers to cancel and retrieve their money if they need to. With anything to do with money, never be afraid to get advice. But it’s only worth paying for if it’s not on offer for free somewhere else. That goes for savings as much as debt. While financial advisers charge for lining up pensions and investments, help for low income households shouldn’t come at a cost. Of course, the internet is the most immediate and cheapest place to start. But Citizens Advice and local money advice charities are worth speaking to first. (One note of caution: We’ve heard rumours of at least one faith-based charity asking for donations in return for their support and Quids in! strongly advises against this. If their offer includes taking part in their religious activity, be prepared to say ‘no’ if it’s not what you want.) Some advice (like on debt) is overseen by government, so check the adviser is registered. 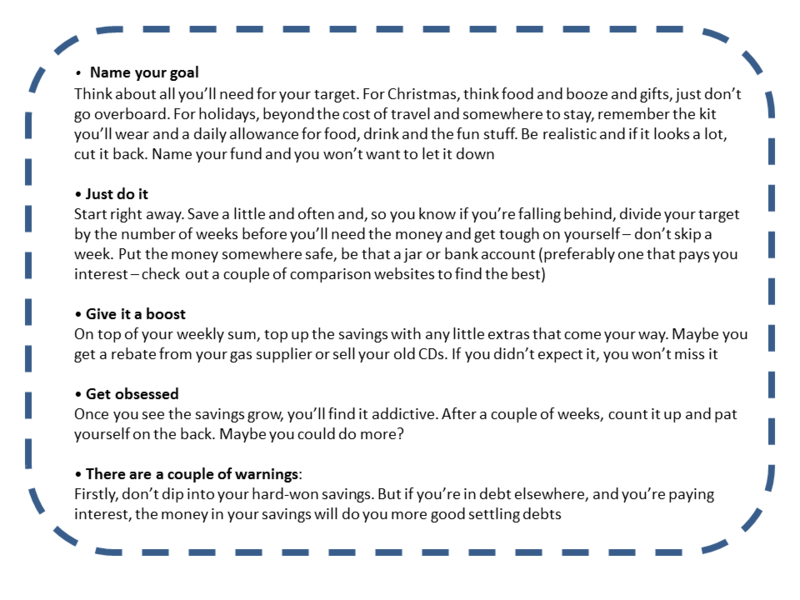 Our Saving Top Tips! Click to enlarge. Will you need emergency access to your savings? The highest interest accounts require you to give lots of notice before withdrawing money, or you’ll lose a lot of interest, or even pay a penalty. Check out the Post Office. Look at interest rates and schemes like Premium Bonds, which are run like a lottery that pays out little wins but where you can cash in your original ‘stake’ at any time. Find out what local community savings schemes there are, such as credit unions or community enterprises like My Home Finance. Many offer better terms on loans once you’re a saver with them. See our Credit Unions page. Read Quids in! 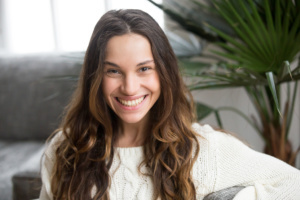 reader Becky’s Saving Story: From Bankruptcy to a Grand. When looking for further advice, the Government’s Money Advice Service website is a great place to start. Advice on savings and comparisons by uSwitch.